Sergio Ramos nodded in a late winner, as Real beat Barca for the second time in a week. Jose Mourinho rested his entire midfield and attack ahead of the game against Manchester United, and reshuffled in defence, too. Jordi Roura was without Xavi Hernandez so played Thiago Alcantara. He played Javier Mascherano instead of Carles Puyol, and David Villa rather than Cesc Fabregas. This was the sixth Clasico of the season and the third in the last five weeks. On the basis that (1) This wasn’t a particularly important game for Real and (2) A usual tactical review would go over a lot of old ground, here are ten bitesize points. Mourinho may have rested the vast majority of his best players, but the shape and feel of the side was very similar to the XI that triumphed confidently at the Camp Nou in midweek. Jose Callejon did a passable Angel Di Maria impression, motoring up and down the line to nullify Jordi Alba’s influence, while on the opposite side Alvaro Morate is in the Cristiano Ronaldo mould – big, strong and aggressive with his positioning. In midfield, too, Luka Modric was fielded to the left in the Xabi Alonso role, while Pepe was given license to move forward in the manner of Sami Khedira. Kaka connected midfield and attack like Mesut Ozil, although he probably played deeper without the ball and stayed more central. Everything was designed so Real could repeat their midweek performance, and although there was an inevitable drop in quality because this was largely a reserve XI, it worked pretty well. Alves’ defending for Real’s first goal looked extremely sloppy – Morata received possession and went down the outside, where Alves gave him plenty of time to send a cross towards Karim Benzema at the far post. Maybe it was just terrible defending, but it looked very much like Alves didn’t know about Morata’s characteristics. Alves got himself in a position to block the Ronaldo-style cut-inside-and-shoot, but Morata was happy to cross the ball with his left foot. Bad defending, or a lack of research? However, later in the first half Morata had a completely free header, which he sent into the near post side-netting, after a good deep cross from Modric on the right. This is something Barcelona have struggled with in recent weeks – Alves being brought too narrow, and a ball over his head towards the far post – they’ve conceded at least four goals in 2012 because of this, and it might be something future opponents can continue to exploit. Barcelona’s passing at the start of the match was quicker and more varied than in recent weeks (when they’ve spent too long on the ball in midfield, and looked short of forward passing options). Here, there was still a problem with a lack of penetration, but with Iniesta in the middle and the play stretched on the left, Barcelona seemed more natural in the way they moved the ball across the centre of the pitch. Pre-match teamsheets suggested Michael Essien would play in midfield, Sergio Ramos would be at right-back, and Pepe would be at centre-back. In a way, all three would be more natural in those positions. Why did Mourinho play with Essien right-back, Ramos centre-back and Pepe in midfield? Maybe for Pepe’s strength in midfield – he did a great job there two years ago after a couple of games where Real had struggled with Barcelona’s midfield passing – but it was probably mainly because of Ramos. He’ll be used alongside Varane against Manchester United in midweek, and Mourinho probably wanted to pair them together, to further their understanding as a partnership. 6. Don’t let Real counter! There was a strange moment midway through the first half when Pepe went down injured on the halfway line, and Real put the ball out of play so he could receive medical attention. In returning the ball to Real, Barca essentially ‘kicked for touch’ (to use a rugby expression) and thumped the ball downfield, giving Real a throw-in level with their own six-yard box. Barcelona then pressed them, boxing them into the corner. But is that not the kind of situation Real relish, with their counter-attacking power? Barca committed eight men into the opposition half, and Real had space to break into. They successfully retained possession from the throw, then briefly broke two-against-two before Kaka miscontrolled. Against most sides it’s a logical tactic, but versus Real it’s not particularly helpful. David Villa did little with the ball, but his permanent positioning on the left helped Barcelona press – the side was able to move forward more naturally as a unit, without the confusion about Iniesta and Fabregas’ positioning. His work rate was also good – Lionel Messi’s first-half chance, when he shot straight at Diego Lopez with his right foot, came after Villa’s pressure forced Michael Essien into a misplaced pass. It’s easy to say in hindsight, after Barca conceded a very late goal – especially as they would have been entirely happy with a point. But having started the game moving the ball across the pitch quickly, Barcelona’s tempo dropped dramatically midway through the first half, to the point where they weren’t even attempting to score a second. Yes, their long passing sequences are part of their gameplan, and ‘one-twos’ feature heavily, but when Messi and Iniesta played a ’seven-eight’ in a position deeper than Real’s central midfield after 31 minutes, you couldn’t help think they were settling for a point rather early. If anyone can pass to a draw, it’s Barcelona – but it didn’t work here. Varane nodded in on Wednesday night, Ramos did it again here. Barcelona’s aerial weakness is nothing new – but without Puyol it’s even more obvious. Even if they weren’t always regulars, players like Seydou Keita, Eric Abidal, Yaya Toure, Zlatan Ibrahimovic and Thierry Henry were often in the side to help defend set-pieces if necessary – now Barcelona don’t have anyone like that, with the exception of Alex Song, who has yet to prove useful. We know Ronaldo shoots a lot, but this was something else – in only half an hour on the pitch, Ronaldo managed six shots – no-one else managed more than three in the entire game. FC Barcelona is on a tilt because of ‘no coach for months’ situation. They should really consider bringing in an emergency coach, too bad Guardiola already signed with someone. Barca need a new coach who they can rely on to be fit and healthy. It’s a shame for Tito but he needs to step down in recognition that he cannot give those assurances. As for Roura, he needs to disappear. He may very well be the worst coach Barca have ever had. Ruining one of the best teams of all time in just a couple of months is a special talent. One of the more pointless clasicos (although now that atletico only drew against malaga the win is very useful for real). 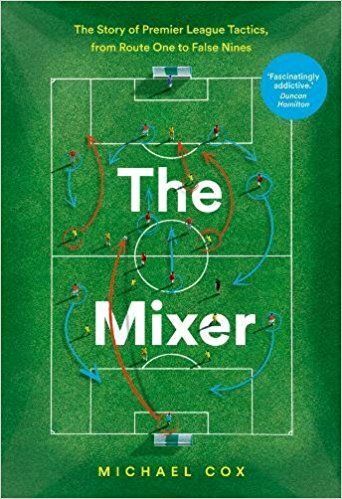 Don’t you think Mourinho should have used this opportunity to test a new system, instead of just replacing certain players with others and making them play the same way (like you described in point 1)? That’s a risk. This is still a clasico against a largely first-string Barcelona side with second place up for grabs. this match had the strange look and feel of a USA preseason friendly. It is so awkward to see a Clasico with daylight. Michael, you make great point about Abidal, Keita and so on. With the exception of Puyol, Piqué and Busquets Barcelona are now tiny. 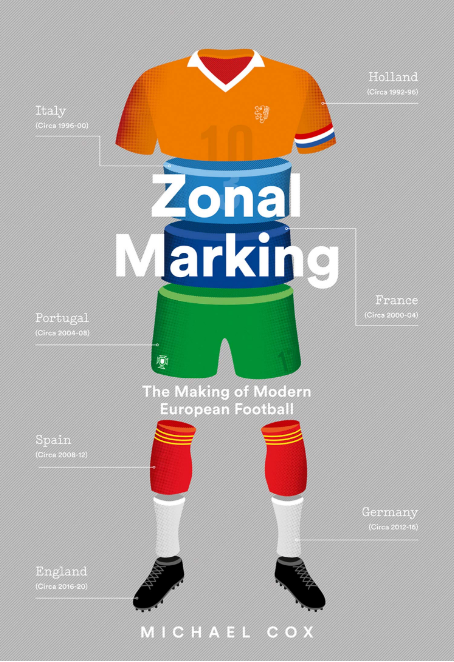 And while their Zonal Marking-system is still pretty good, they might have become too small as a team. I wonder when teams will actually try to play for a corner against them (like sides do, when they want to waste time, while leading near the end of a match). This was a major part of Chelsea’s plan last year. During both legs they were attacking for the corners, which allowed them to waste time and to attack one of Barca’s vulnerabilities. Even defensively this held because they looked for chances to break on the counter then. Mascherano has not played a good game this season. The decline of Puyol, Pique and Alves are devastating and Bartra and Montoya should at least have a chance. Again, Roura is the worst coach of century, he should resign if he has any integrity. He has completely destroyed Barca in a month. Moreover Barca has won 0 games against Madrid in the last five games. The biggest issue plaguing Barcelona right now is a lack of verticality. They just aren’t providing enough forward options for the midfielders. As a result, sterile possession. Tottenham’s 2 goals today against Arsenal illustrate what’s been missing for Barca. Lack of movement. We saw Adebayor run diagonally, dragging a CB with him and creating space for Bale. Not too dissimilar to Sanchez or Pedro running diagonally and creating space for Messi. We also saw Lennon making a run from the right flank to the center. Not too dissimilar to a goal that Sanchez scored against Getafe. It’s time for Barca to play with a CF. Villa needs to go into the middle to occupy the CBs. Moving Villa centrally also helps give the wide players someone to aim for with low crosses, someone for Messi to play 1-2’s with, and someone to play through balls to. As for Messi, if it’s too congested in the middle and he’s looking for space, he needs to find it on the right flank rather than to drop deep into midfield. Messi lazy? Maybe, but can you blame him? He’s our SOLE goal threat and has to suffer playing with Alexis Sanchez. Just HAVING Messi on the pitch changes everything. His through ball passing, the usual diagonals to the left, have been awful lately. Teams are figuring out Messi. He needs to play on the right wing again with Alves. Villa through middle, Pedro or Tello on left. Arsenal was playing with a very high line, which gave loads of space for Tottenham’s forwards to run into. Barça very rarely are given that luxury. Agreed on lack of verticality though. Even if teams defend very deep, there’s no excuse for Barca’s forwards to not make those same diagonal and decoy runs we saw from Tottenham. That’s what I was actually getting at. But what worries me as a Barca fan is that Madrid did play a high line for a majority of the match, and Barca didn’t do enough to exploit that. Barca are certainly having a few rough weeks here, and this very well could be the end of the Barca reign (all must come to an end), although they are still going to win La Liga. Some coaches, like Pep, stick by the method of staying with a club for no more than 3-4 years because that is the natural cycle for a club under one manager. It’s hard to motivate the same players with the same methods with the same manager for any longer…. or so goes the theory. On top of which, after being in the spotlight for those years, teams eventually will figure out a way to knock you off your perch… or the squad simply ages out of their prime, or a combination of both. 1) he always prepared his team against each opponent: the passing barca played was never exactly the same! 2) he was never reluctant to experiment with new formations (e.g. the back three). Very interesting point on #2 about if Alves being used to Ronaldo contributed to his positioning. Ramos more natural at right-back? I know he’s good there, as well, but I definitely think he’s better as a centre-back. Ok. I completely agree – just interested in knowing your thoughts on it. How highly do you rate Ramos as a centre-back, out of interest? As good as Kompany, Hummels, Thiago Silva and (an in-form) Pique? Better? I think he’s an excellent defender, but he can make some rash decisions and his disciplinary record is terrible (at least at club-level.) On paper, it seems logical that he should be paired alongside a calmer defender – a Varane, rather than a Pepe. I remember Mourinho being asked about Ramos’ place in the team when he first got appointed at Real. His response was that he is a great right back but has the potential to be “one of the best” at center back. Also, Ramos was, for me, Spain best and most consistent performer at the Euro. I still despise the guy, of course. Point #3: this. I can’t even count how many times opponents have gotten a chance or scored a goal because of this. Alves being tucked in next to the CB and there’s a free man standing right behind his back. You can see this kind of situation unfolding over and over again. I’m no expert but shouldn’t the RB’s first priority be taking care of the guy on his side of the box and let the CBs deal with whatever is going on at the penalty spot? Why does Alves keep making this mistake when it has proven so fatal? Alexis’s first touch and finishing are very poor. No doubt about that. But his work rate and movement is important to the system. It won’t show up in the state sheet but he’s created some chances just by making runs to drag defenders with him. As for Pedro, it’s a complete mystery to everybody. He use to always be in the right place at the right time. I don’t even notice him on the pitch anymore. As for #3, there’s been an interesting article recently (http://allasfcb.blogspot.in/2013/02/full-back-covering.html), giving Dani some alibi. Regarding #9, FCB have lost very few headed/set pieces goals, Madrid’s been the only team to constantly threaten them that way; their zonal marking system really does work pretty well. The biggest problem is Vilanova’s absence; it’s Roura’s first year as an assistant manager, and he’s been forced into a rather difficult and unexpected situation, into a job he just isn’t cut for. The passing is much more direct. Barca are not as patient and the team lacks vertical width to create space for Messi. Lack of intense pressure from the front to retrieve possession. Hence, Barca are conceding possession more often. They are conceding it via longer passes generally, hence are not as close to the intercepting player to retrieve it quickly and are not retrieving the ball very quickly and exploiting defensive mistakes. How good Pep was may ultimately be proven with his moving on. i think these games highlight how much Barca are dependent on Xavi is for their tika football to work. He really set the platform and without him Barce seem out of sorts and loose around 85% of their effectiveness. Xavi is already 33 and is becoming a bit more injury prone like in the old days and without him, barca don’t seem to have a substitute who can do what he does effectively. I thought Fabregas could be the answer but he hasn’t been picked for that role and Thiago just isn’t up there yet or maybe he wont ever be(only time will tell). Put it simply they don’t have a plan B when things don’t go their way. On the issue of Alves positioning, there are a few points worth consideration. Quite often Pedro is being asked to cut inside from the right flank to perform a No9 role during games. When he does this, it leaves Alves to work the entire right handside himself. During transitions, Alves gets caught out but there is no direct cover in front of him. The left flank also has problems due to Jordi Alba attacking simultaneously with Alves. Alba cannot recover as quickly as Alves and many teams are attacking the Barcelona left. Crosses are aimed at the far post where Alves is poorly positioned but he has no help from the right midfield area. Also, with Pique being out of sorts at times, is Alves positioning himself closer to Pique for covering purposes? Alves never used to move that tight to Pique? 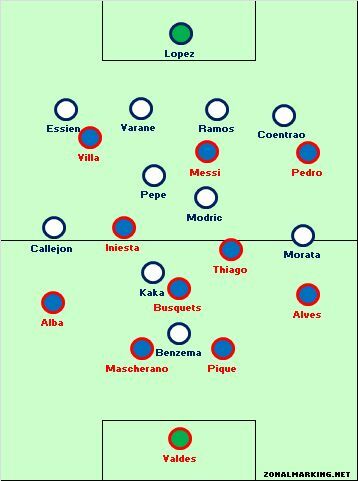 IMO, this is the definition of a tactical coach, can change 6 players and execute the same gameplan (tactics) and still win against Barcelona starting XI (minus Xavi), that is pretty much all the evidence I need to say that Mou has finally figured out a way to beat the tactics that Barca use. Considering just how rigid Barca is with experimenting with other tactics (they won’t use target man, longball, physical play), I think this strategy could be used for quite some time now. Apparently, Barca are going to play something like a 3-3-4 against Milan. Who knows how will this formation work, but it’s good to see that they are considering changes. Anything is better from the football they’ve been playing in the last 2 weeks. there is nothing special about barca playing a 3 men defence. last year against chelsea they started with the same approach and just had to overcome 1 goal! only an early goal + a miracle can keep the catalans dream alive. milan will fight their hearts out n will be waiting for deadly counters. 1. Unfortunately for barca, the top teams have figured a way to play against them firstly inter of maurinho, then milan and now real madrid – after getting thrashed many times, they finally have a game plan that can contain barca, whether this is because barca has lost quality or the opponent simply figured them out. 3. selling ibrahimovic was the biggest mistake they did, if he had stayed ibra would be the plan B they so badly need to change games. guardiola was a genius but unfortunately couldn’t make the player stay. 4. this game shows the immaturity of roura, with real madrid essentially playing a reserve squad – and barca leading the table and playing a non important game – this was a game barca didn’t need to play the whole 1st team nor provide the chance for madrid to humiliate their 1st team. 5. alves alves alves – overated, defensive liability, i can say the reason chelsea won last season was because alves was terrible. 6. xavi, iniesta, fabregas all too easy..
Out of curiosity did anyone observe any point in the match were Pepe/Ramos/Essien were in their alternative positions? Teams have not “figured Barcelona out” in my opinion. Barcelona are simply no where near the level they have been- mainly in the area of ball retention. Barca has been extremely sloppy with the ball sans Xavi. Iniesta may be the most talented player in the world, but he is not the one to provide order. Xavi gave order to everything. Busquets has given more balls away this season than I saw from him in the previous three combined. Thiago does not read a game well at all with his passing. Real are a team designed to live on the mistakes of others, and that’s exactly what they done against Barcelona recently. Without mistakes to exploit, they become a very underwhelming side to watch despite their talent (see overall Liga form). Barcelona needs a center forward purchase in the summer. They need an off the ball terror to help open spaces in both the middle of the pitch and final third. Ibra didn’t work because his work rate was almost non-existent off the ball. Cavani would be ideal, but Napoli will only let him go for a ridiculous fee. A further issue is really that video gaming became one of the all-time main forms of fun for people of all ages. Kids have fun with video games, and also adults do, too. Your XBox 360 is amongst the favorite video games systems for those who love to have a huge variety of games available to them, in addition to who like to relax and play live with other folks all over the world. Thank you for sharing your notions. Following study a number of of the weblog posts on your web site now, and I genuinely like your way of blogging. I bookmarked it to my bookmark internet site list and will probably be checking back soon. Pls take a look at my web web-site at the same time and let me know what you feel. The next time I read a weblog, I hope that it doesnt disappoint me as much as this one. I mean, I know it was my option to read, but I essentially thought youd have some thing fascinating to say. All I hear is actually a bunch of whining about something that you could fix in the event you werent too busy seeking for attention.